This Masterclass sold out in one hour. If you want to be notified of future workshops, subscribe to my newsletter. In addition to receiving first-hand notification of future worskhops, you'll also get my eBook '10 tips for better travel photos' completely free. North India in general and Varanasi in particular have always been looked upon as a photographer’s paradise. But even the best locations and most interesting subjects are not enough to create amazing portraits. There are other factors that come into play and the biggest of them all is lighting. Below are some examples of the types of images you can expect to be adding to your portfolio over the course of this eight day Masterclass, which will be held from February 25th to March 5th in Delhi and Varanasi, India. Matt Brandon is a Malaysia based humanitarian and travel photographer, who collaborates with NGOs to tell their stories and to train their field staff to do the same. Well known as a photographer and international workshop instructor, Matt’s images have been used by clients such as Partner Aid International, NeighborWorks, the BBC, Honda Motor Corporation, and Bombardier Transport Corporation, Asian Geographic, KLM Airlines and others. His photographic pursuits have taken him to the countries of Egypt, Tibet, India, Indonesia, Thailand, Maldives, Philippines and Malaysia to name a few. Matt also is known for teaching presenters how to present their message in the most effective and memorable way. This makes Matt a great teacher to any workshop or classroom. Matt is also a key member of the International Guild of Visual Peacemakers, he’s on the advisory board for Focus for Humanity and on the design board for Think Tank Photo, a camera bag manufacturer. Visit Amazon.com for Matt’s book of images from Kashmir titled “Kashmir, Mystery“. 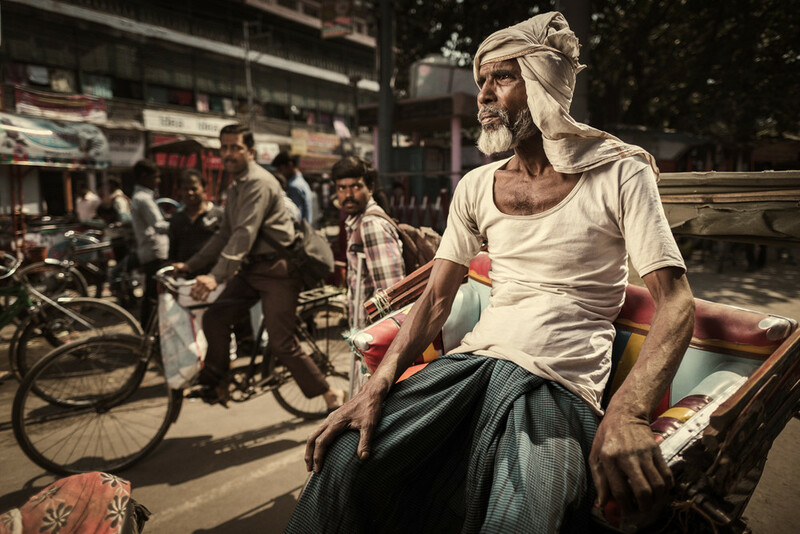 Piet Van den Eynde (pronounced “Pete”) is a Belgian freelance photographer specializing in travel portraiture. He has written five Dutch books on Adobe Lightroom and currently has a dozen English ebooks for David duChemin's Craft & Vision label, such as ‘Making Light’ and ‘Making Light 2’. He also has a six hour ‘Photoshop for photographers’ video course. Finally, he has created three sets of Lightroom preset packages, one for Black & White, one for Color Grading and a mixed one. He contributes articles to photography magazines and offers photographic training worldwide. He’s an Adobe Photoshop Lightroom Certified Expert and is the co-founder of Photofacts Academy, the Dutch online training portal for photography and postprocessing. In 2009, Piet threw his camera, a flash and an umbrella in his bicycle panniers and cycled 5000 miles through Turkey, Iran, India and Indonesia. Piet will be teaching off-camera lighting skills as well as some Lightroom post processing throughout this Masterclass. Don't think the Masterclass is only about artificial (flash) light or posed portraits. We use available light and street photography techniques just as well. All the above images were photographed with available light. In fact, it's the mix between these two approaches to travel portraiture that makes this workshop unique. To us, the difference between available light and flash is an academic one: we simply use the light that is most suitable for the image we have in mind. Arrival in Delhi. You will be welcomed by our representative at the International Airport and transferred to your comfortable hotel in Delhi. As most participants will have arrived late the previous day, we take an easy start with a nice breakfast at the hotel. We introduce ourselves and have an orientation meeting. 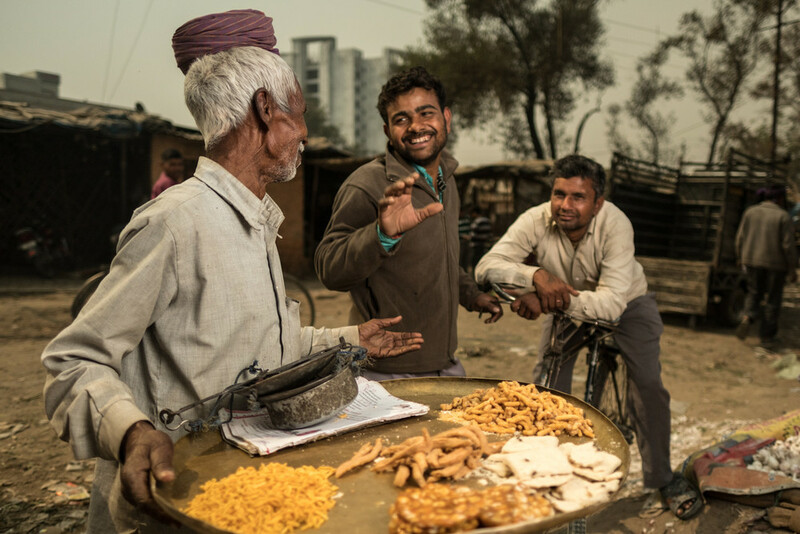 Then it’s time to pick up the camera bags and explore city life in Old Delhi’s Chandni Chowk Market. This is as bustling as it gets! We will explore the back alleyways of this ancient quarter. We’ll visit old mosques ranging from the laid back small Fatehpuri Masjid to the magnificent splendour of the Jamma Masjid. From the streets of Old Delhi we travel to the holy shrine of Sufi saint Hazrat Nizamuddin. More Delhi exploring is on the agenda today. Depending on your preferences, we'll visit some new sights, such as the impressive Sikh temple Bangla Sahib Gurudwara or we'll revisit some of yesterday's locations for a second, more in-depth look. In the evening we will travel by overnight '1st Class' train to Varanasi: an experience all in itself! Before we get some sleep on the train, we’ll introduce you to some of the gear that you will get a chance to use during the rest of the trip. As you can see, no time is wasted! We arrive mid-morning into the magical and mythical city of Varanasi and will be met at the station by our staff. We'll be transferred by boat to the hotel: a beautiful and characterful haveli with a breathtaking view on the Ganges. This is probably the hotel with the best location in all of Varanasi. In the afternoon, we will introduce you to our fixer and his crew. He will assist us in creating the images that we have in mind. After having worked up our photographic appetite the previous day, we now have four full days to photograph the city and its people. We will portray Varanasi and its inhabitants in all possible ways, at all possible times and using all possible modes of transportation: on a couple of days, we will wake up early and experience the life of this ancient city by boat. The boat ride passes along some of the 100 ghats (bathing places), with numerous palaces built by Hindu kings. You’ll be able to experience first hand the early morning rituals being performed by the Hindus. We will photograph sadhus (the wise old men that stroll along the Ganges) but we’ll also explore the back alleyways of Varanasi with its colorful markets. From the milk market to the flower market and the fish market to the chicken market! What makes this workshop unique, is that there will be a mixture of classical, available light street photography with more formal portraits where we will use our flashes to defy and even tame the blazing Indian sun. 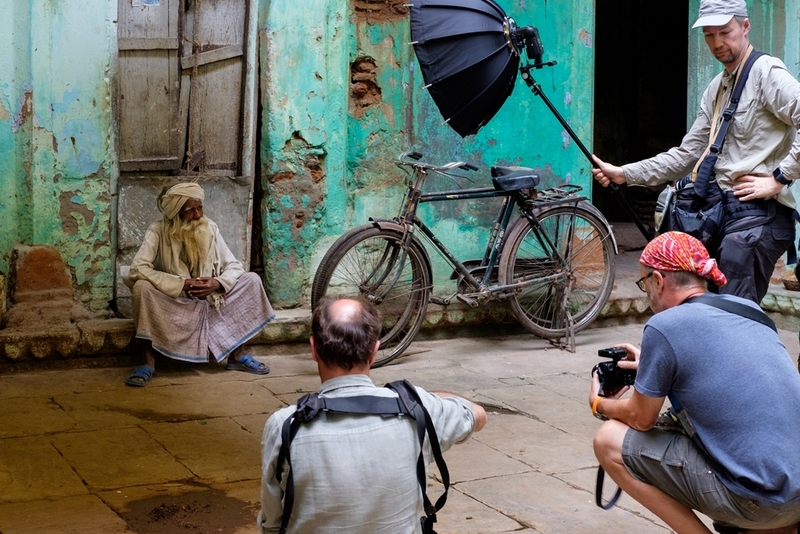 We’ll practice shooting for storytelling, composition and how to use flash to balance the harsh Indian sunlight. One night, we will have an image critique. Another night, we will have a session on postproduction. These sessions are included in the price but if you prefer to just relax or go out and shoot some more, that's fine, too! After all, it's your workshop! Alas, it’s time to go… but we still have a full morning to shoot some more portraits or hunt for souvenirs for those of you who cannot return home empty-handed. After all, you would like your significant other back home to allow you to participate in future workshops, right? In the afternoon, we’ll head back to Varanasi Airport and embark on our flight back to Delhi. We’ll transfer from the domestic to the international airport and then it’s back home with a suitcase full of memories and a camera bag full of memory cards! While most travel photography workshops have an 8:1 or even a 10:1 guest:instructor ratio, we have purposely limited the number of participants on this trip to only six. With two instructors, this makes for an incredible 3:1 guest:instructor ratio. We therefore expect this Masterclass to sell out quickly. We regret that we cannot hold spaces: all six spots will be allotted on a first come, first served basis. Your stay in a shared double room. You can opt for a single room on the registration page (subject to availability). The single room supplement is $900. Your international flight to and from Delhi. As if the destination, the photographic opportunities, the itinerary and the limited number of spots aren't enough to encourage you to book quickly, we have an early bird bonus: every participant who books before end of August, 2016 will receive Piet's complete Craft & Vision's 'Lighting, Lightroom and Photoshop' training titles for free. This includes 3 Lightroom preset packs, the 'Making Light' and 'Making Light 2' ebooks, the 450 page 'Lightroom 6/CC Unmasked' eBook and the 6 hour 'Photoshop for Photographers' video training (a combined value of $127). Belgian and Dutch subscribers get a free copy of Piet's Dutch Lightroom eBook and a one year membership to Photofacts Academy, the Dutch online photography and postprocessing training resource (a combined value of €124). If you still have questions, don't hesitate to contact me. If on the other hand you're ready to book a spot on this amazing journey, please fill out the Masterclass' registration form on Matt Brandon's website (www.thedigitaltrekker.com). Just follow this link or click on the screenshot below. To secure your application, we'll require you to make an immediate $1000 deposit via Paypal (if you don't have a Paypal account, you can open one here - it's free) and pay the remainder by October 31st. We hope to see you on February 25th! Click on the screenshot above to go to the actual registration form on Matt Brandon's website. We also thank Cactus Image to provide each participant with a camerabrand-independent yet highly powerful flash trigger to use during the workshop. Read more about the fantastic new Cactus V6 Mk II here. Finally, we thank our educational sponsors, Craft & Vision and Photofacts Academy for the early bird bonuses.